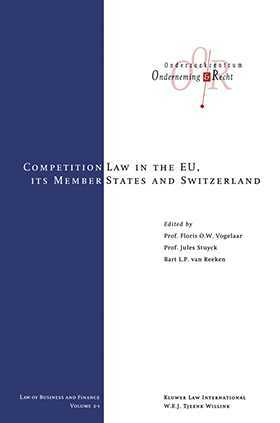 In the past fifteen years, the Member States of the European Union have enacted new national competition laws, or amended their existing competition laws, so that these laws are now all more or less converging upon the EC competition rules as laid down in Articles 81 and 82 of the EC Treaty and in the Concentration Control Regulation 4064/89/EC (as amended by Regulation 1310/97/EC). This text is believed to be the first of its kind to include all aspects of competition law of all countries concerned, i.e. the substantive rules on restrictions of competition and abuse of dominance as well as the rules on concentration control. In respect of both issues, the rules of procedure and enforcement are also set out. In addition, the reader will find a short synopsis per country of the powers of special sectorial regulators (if any) in fields such as telecommunication, energy, broadcasting and public transport. Finally, the substantive and procedural rules of Switzerland have been included in this work, that country being an important trading partner for almost all Member States and being geographically encircled by the EU. Written by distinguished competition law specialists from each Member State and from Switzerland, the work has been set up to be as practical and informative as possible. Not only has the existing legal framework been described - with footnotes referencing landmark decisions; annexes providing practical information and 'charts' on the decision making process in each country - but, also, where appropriate, it has been explained how the legal system works in practice. As such, this work should be interesting to all private practitioners, in-house lawyers, bankers, accountants, tax advisers and to all others who come across competition law in their daily course of business. Special Sectors and Regulated Markets.